I’m continuing my “best of my old blog” today with the bookcase styling post that had the most hits on my blog: over 3,000 hits and still counting! 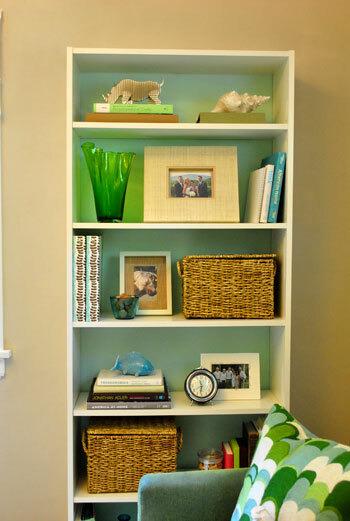 Bookcases are like lizards–scary and hard to get past! Whenever I go to decorate a bookcase, I ALWAYS start by looking at inspiration pictures for scale, clustering ideas, and how to not make it look cluttered, but full. 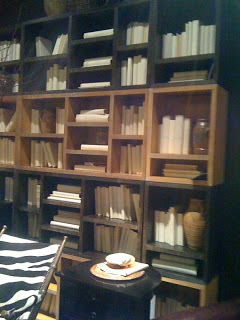 Pull everything off your bookcase and stack things into piles– books by color and size and then the accessories. This way you can see your space with fresh eyes and get a good look at the proportions of books, pictures, accessories, etc. that you had on the bookcase. What do you need more of? Less of? Look to your hobbies and interests for inspiration. Take a look at things around your house and make sure to display those pieces that have meaning to you. -If you have a collection–GREAT! But remember if you have millions of pieces, it might be best to pull just your favorites out and show a small portion of your collection. From time to time, you can then change out those pieces for a fresh look! This bookcase is WAY to cluttered– you can’t decipher one piece from the next! It’s better to choose just a handful and display them in a unique way so that they stand out more! Play with size and shapes! -Pull together different sizes and shapes of frames for pictures and even include some art to add more color to the bookcase. -Don’t use all small accessories- that tends to make your bookcase look cluttered alot faster! 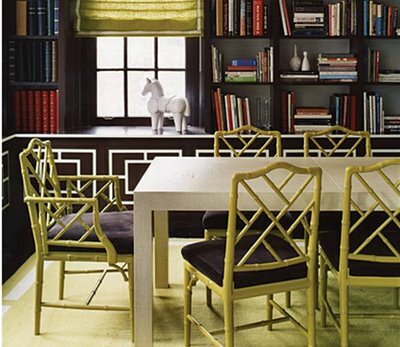 Make sure to have a few pieces that are larger that take up visual space without looking cluttered! -Varying heights is important too! But remember if you have several accessories that are the same height, you can always build them up by stacking books or boxes underneath a few of them! It’s good to keep things symmetrical- but remember, you don’t have to! I like to have most things symmetrical, but then have a few things “off” a bit to add interest. Wrapping books in matching paper. So the process is easy once you have everything that you want at your fingertips! -Books go first. Arrange them on the shelves as you like them. Play with numbers, heights, and widths. -Then add your larger accessories– candles, baskets for storage, larger pictures/art, etc..
-Next comes the smaller items- pictures, figurines, etc.. Stand back and admire your new beautiful, styled but-uncluttered bookcase! Here are some images that I came upon that I loved!